I have mentioned this before: The Hubs has been gone more than he has been home this summer (or so it seems). Since the middle of July, he has spent an accumulation of four weeks in the Houston area for work related projects. Luckily, most weekends he is able to make it home. His request for the past weekend was to “get his grill on.” Our grilling time and patio-sitting time has suffered immensely this summer. We both miss it. We decided that for Saturday night we would grill fajitas. I always have a plethora of New Mexico dried chiles in the pantry so when I saw this recipe in my cherished The Gourmet Cookbook, I jumped at the chance to revamp it a bit. The original recipe created a quick marinade and sauce for a pan-seared steak. I added a bit of red wine vinegar and peppercorns to the sauce and decided to use it solely as a marinade. The results were quite delicious if I do say so myself. Heat a small heavy cast iron skillet. Toast chiles, pressing them down on each side, until slightly darker and more pliable. (I used a heavy sauce pan to press the chiles as they toasted.) Toast on each side for 10-15 seconds. Remove from pan and discard seeds and stems. Cover toasted chiles with hot water and let soak for five minutes. Drain and tear chiles into smaller pieces. 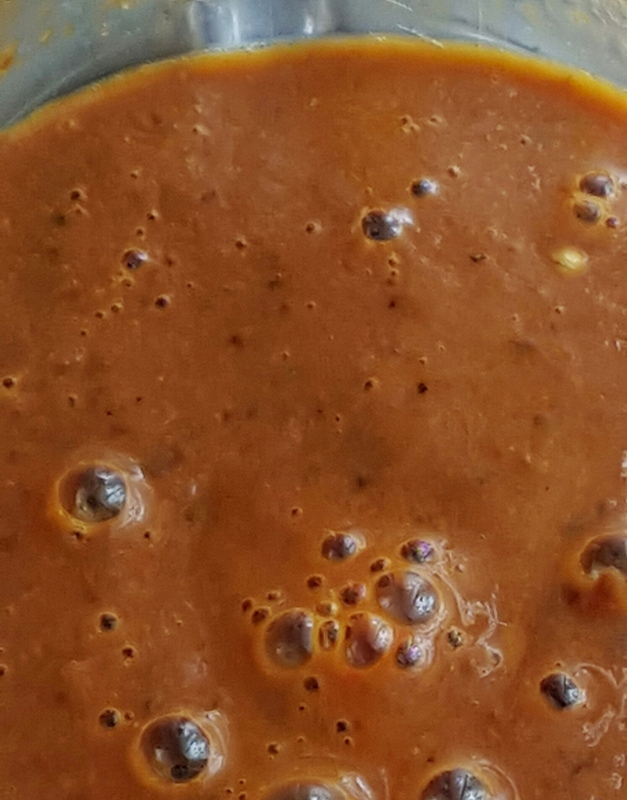 In a blender, combine chiles, orange juice, garlic, olive oil, vinegar, peppercorns and salt. Puree until smooth. 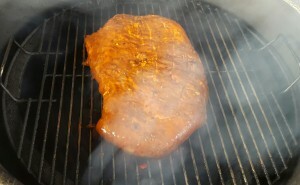 Place the flank steak in a sealable bag and marinate in the pureed mixture. Place in refrigerator and marinate for 4-6 hours. Heat grill to medium high heat (around 375 F.). Grill steak about 4-6 minutes per side. Transfer cooked steak to a platter and let stand, tented with aluminum foil, for five minutes. Slice steak on an angle across the grain and serve fajita style. As I taste tested the marinade straight from the blender, I noticed that this might make a tasty salad dressing, especially for a taco salad. More research is needed. With some fresh made salsa, some tortilla chips and a half-pitcher of margaritas, these fajitas made a complete meal! 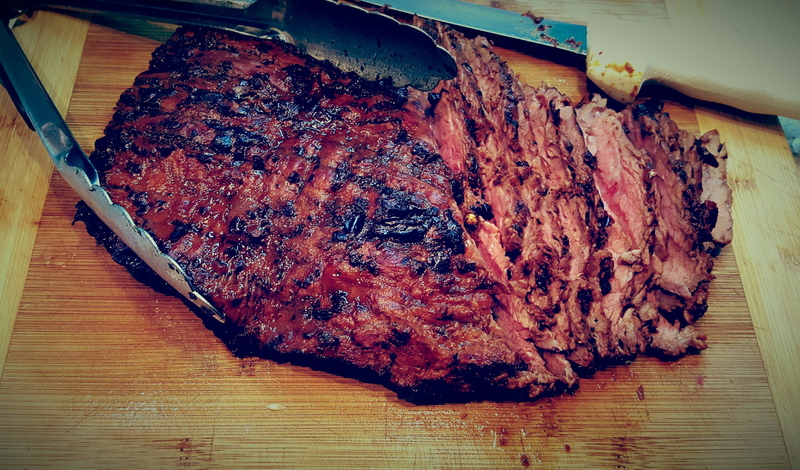 I highly recommend this flank steak for any Labor Day cookout you might have planned this month. I hope you have a relaxing weekend. I’ve felt your pain this summer, as I’ve been away from my bride for much of it. This flank is definitely worthy of a homecoming meal. Looks wonderful. I wish I could have a few slices to make a hearty sandwich for the lunch! It looks fantastic, Debra. 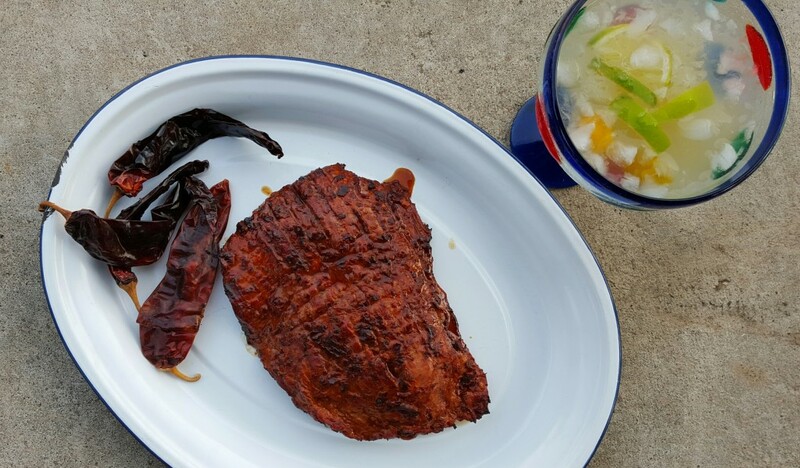 You had me at chile orange flank steak. 🙂 Sounds delicious. Pinned. Swoon. I’m sorry that you guys didn’t get a chance to grill much this summer, but hope that the fall will give you many opportunities, especially if this is the kind of thing that comes off the grates. It looks amazing. We grill quite a bit. I like your recipe for flank here, must try it. We usually marinate flank with soy sauce, pineapple juice and brown sugar. But I have to try your version! You’re making my mouth water and I’m craving fajitas! I’m not generally a person who likes citrus and beef however, as I read this recipe my mouth started watering so I think I must try it! I love sweet hot.